Systemic sclerosis (SSc) has the highest cause–specific mortality of all the connective tissue diseases, and interstitial lung disease (ILD) is the number one cause of death among patients with SSc. Historically, therapeutic agents with widespread immunosuppressive effects have been used to treat SSc-ILD. However, data from recent landmark clinical trials in SSc-ILD have affirmed the prior observation that SSc-ILD is a uniquely heterogenous disease with marked variations in rates of response to immunosuppressive therapy. In the last few years, innovative research studies have advanced our understanding of the pathophysiology of SSc-ILD and stimulated interest in the development of novel candidate therapeutics with potential disease–modifying properties for SSc-ILD. Anti-fibrotics are a new class of drugs that may change our approach to the treatment of SSc-ILD similar to the paradigm shift that occurred for the treatment of idiopathic pulmonary fibrosis (IPF). The present review describes the most recent advances in our understanding of SSc-ILD in the context of lessons learned from the study of IPF. The article concludes with an outline of the most important unanswered questions in SSc-ILD research that could help inform future research efforts in this area. 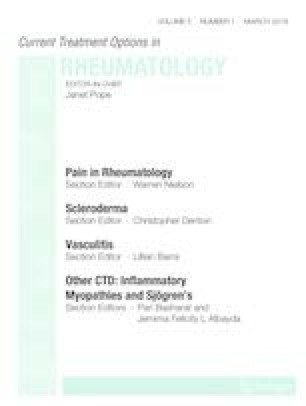 The author, ERV, received financial support from the Rheumatology Research Foundation. Augustine Chung and James English declare that they have no conflict of interest. Dr. Volkmann reports personal fees from Boehringer Ingelheim, during the conduct of the study. Thomson CC, Duggal A, Bice T, Lederer DJ, Wilson KC, Raghu G. 2018 clinical practice guideline summary for practicing clinicians: diagnosis of idiopathic pulmonary fibrosis. Ann Am Thorac Soc. 2018. https://doi.org/10.1513/AnnalsATS.201809-604CME.